Night+Market is the creation of Chef Kris Yenbamroong, who has seen his name rise in recognition since his restaurant opened at the end of 2010, winding up on seemingly every best new chef or best chefs under 30 list. 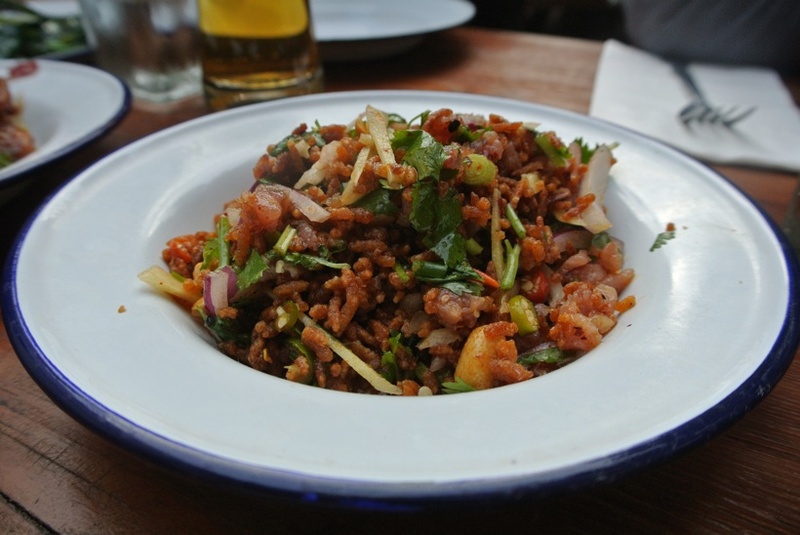 The food is “street food” inspired and meat-centric, with an emphasis on specialties from the northern region of Thailand. N+M is located inside of another Thai restaurant, Talesai, which his parents have owned on the Sunset Strip for over 30 years. The restaurant had been on my to-eat list for quite some time and for whatever reasons I hadn’t made it out. That is, until some friends insisted on doing a DineLA dinner, which Night+Market happened to be participating in, and the stars finally aligned for my first visit. What’s so great about doing DineLA with a group is that you can order a ridiculous amount of dishes and not spend much more than you would ordering the tasting menu, so long as everyone agrees to share. There were five of us eating on this particular night, and the special menu offered three courses with a choice of two dishes for each. We decided to order two DineLA menus, in order to try every item on it, and then ordered almost the entire a la carte menu, save for a dish or two. The result? An insane amount of food that ensured no one left anything less than stuffed to the point that the rest of the night was a wash. 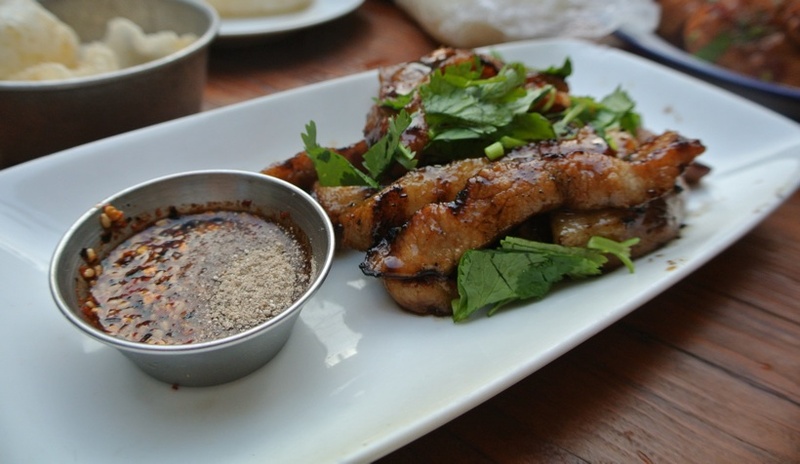 The DineLA menu started off with an order of “party wings” that had me ready to renounce all other chicken wings for a lifetime supply of these guys. 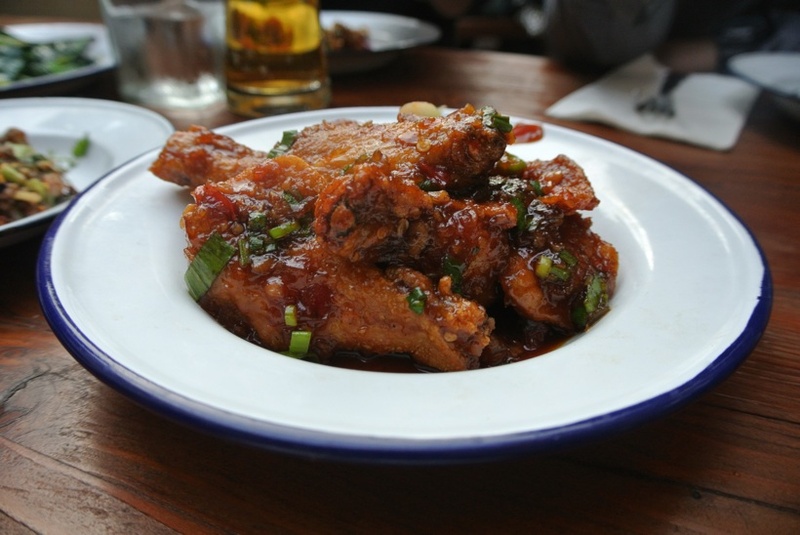 The wings and drumsticks arrived crispy, and were doused in a sweet-spicy glaze that demanded an eat first, worry-about-napkins-later mindset. I’ve had this dish at countless Thai restaurants over the years, but this version was by far the best. 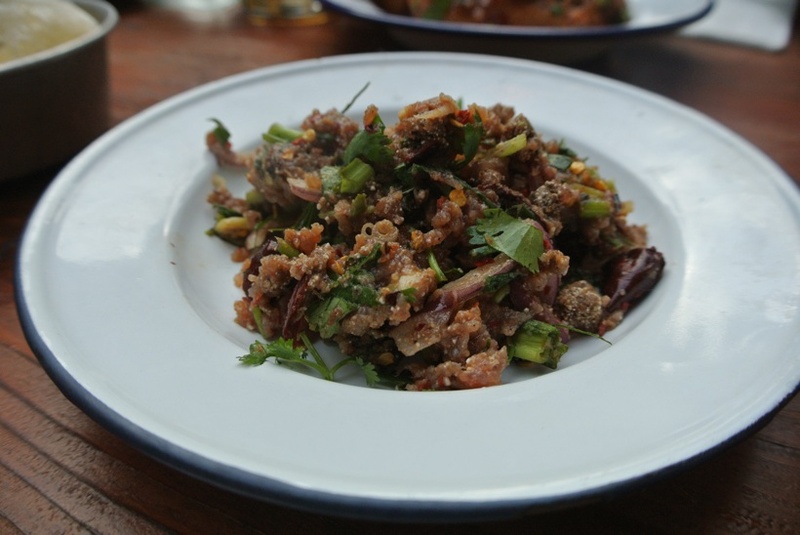 The interplay between sour and spicy was superb, while the crunchy grains of rice provided the key textural element for the amalgam of flavors. 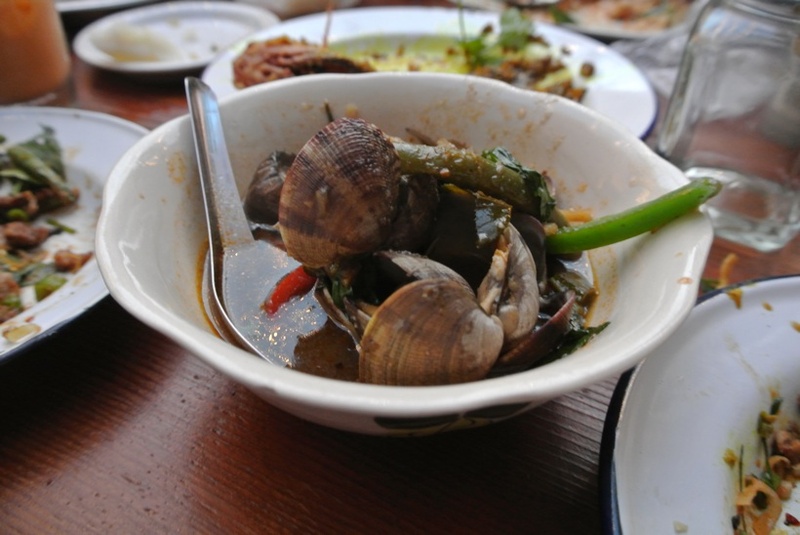 Clams in a curry-broth were up next, but seemed to lack the same intensity of flavors present in the first two dishes. Unfortunately, I also found myself picking out bits of shell during a couple of bites. This was certainly unlike any ceviche I’ve had. The tuna was ground into a paste almost, which allowed it to serve as a base for the litany of flavors: pungent, herbaceous, and insanely spicy if you made the mistake of letting a piece of chile sneak into your mouth. I should also note that the homemade shrimp chips served on the side were outstanding when used to scoop up bits of the ceviche. I thought the curry element in this dish worked a lot better than with the clams. The broth was rich and beefy, and really softened up the noodles. The accoutrements alongside the plate added some needed depth in balancing the whole dish. 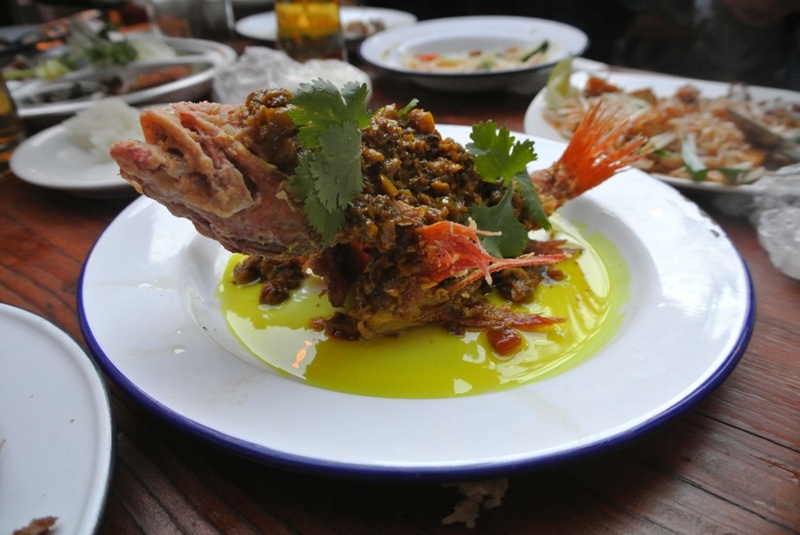 By far the most visually striking dish of the night, “idiot” fish (nicknamed for it’s over-sized head and cartoonish eyes) arrived fried whole and slathered with a garlicky paste. By the time we were done it looked like it had fallen prey to a tank full of piranhas, the bones left without a trace of flesh. With the DineLA portion of our meal complete we moved on to some a la carte supplements from the regular menu. Deep fried bites of fatty pork on the bone were stellar. 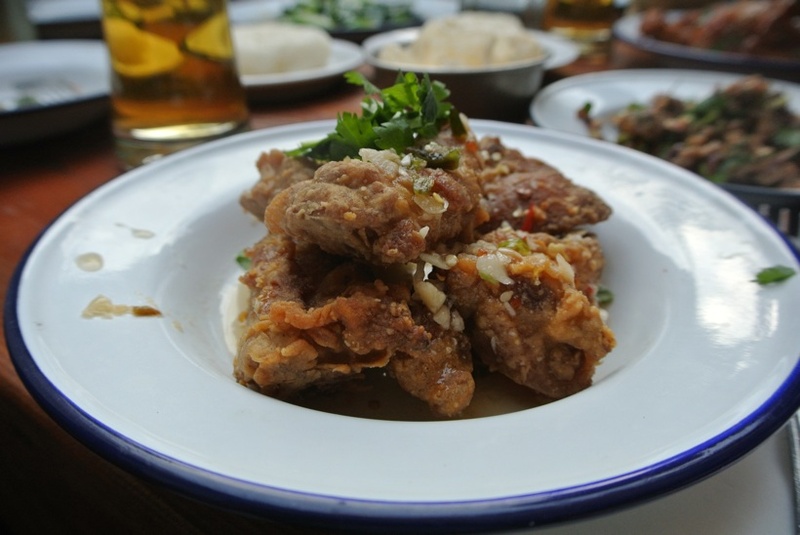 The initial bite of crispy skin gave way to tender, moist meat that needed little effort tear away from the bone. The vinegar-garlic sauce spooned over the top helped to cut through the heftiness of the dish. One great pork dish deserves another, and this certainly fit the bill. I would love to see this cut of pig show up on more menus (I know that Isaan Station, Kang Ho Dong Baekjong and I’m sure other places already serve it); firm yet fatty, it reminded me of a cross between a pork chop and pork belly. The smoky, spicy chile dip disappeared just as quickly as the strips of grilled pork neck. 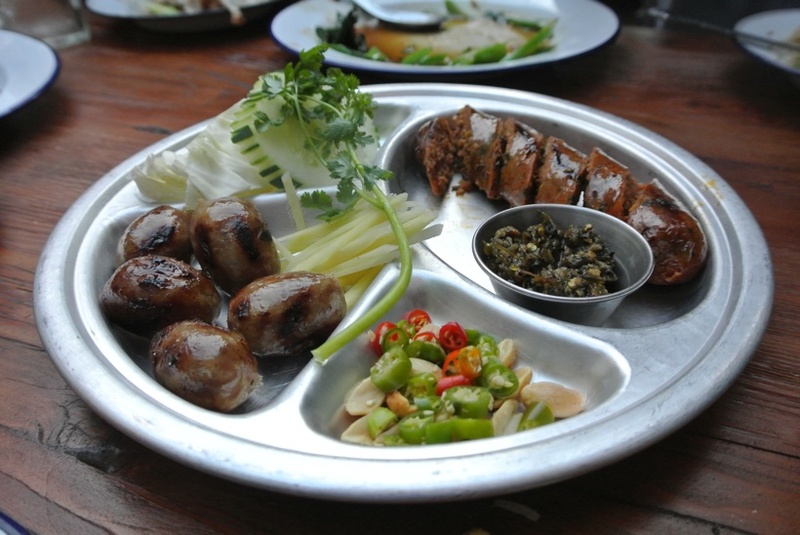 A platter featuring two different Thai sausages was presented next. On the left was a fermented pork sausage that had a marked sourness to it. 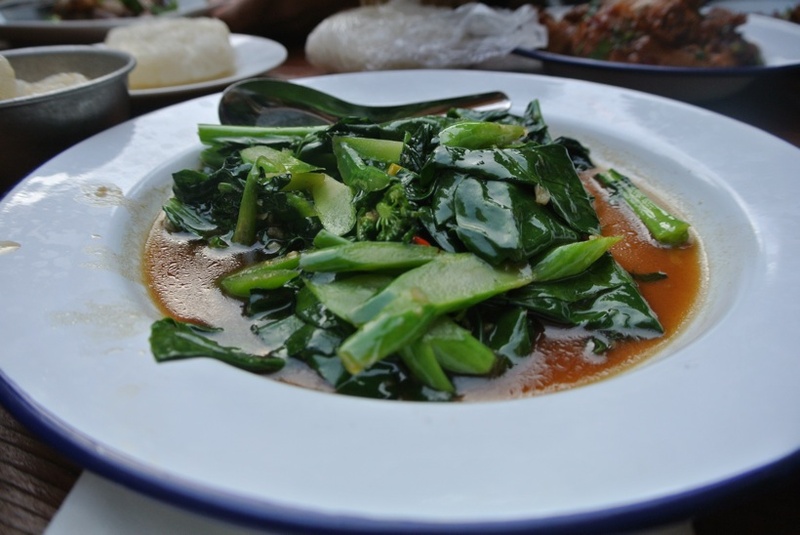 However, following the menu’s instructions that it should be eaten with all the elements on the plate made for a wonderful bite with sour and spicy notes competing for attention. On the right, we had another pork-based sausage, rustic with strong herbal flavors taking center stage. The noom salsa, comprised primarily of roasted peppers and garlic, was a welcome compliment to the liberal use of herbs and saltiness of the pork. 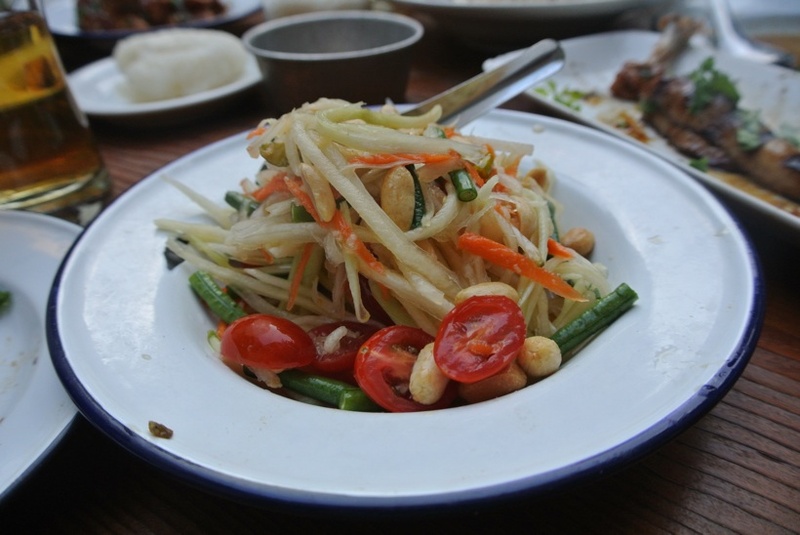 Papaya salad has long been a favorite of mine, though many restaurants don’t do it justice. Chef Yenbamroong’s version was crisp and refreshing, a welcome change of pace from the bevy of meat dishes up to this point. The only thing lacking (a matter of preference I suppose), was the absence of the tiny dried shrimp that add a brilliant saltiness. Even without them, this was certainly one of the best versions of papaya salad I’ve had. The night’s only other non-meat dish was a straightforward presentation of kai-lan, with crunchy stems and leafy tops. The broccoli’s natural bitterness was offset by the garlic and savory cooking liquid. I wasn’t exactly sure what to expect from this dish, but the intoxicating aromas that filled my nose as soon as I unwrapped the banana leaf assured me that it would be good. 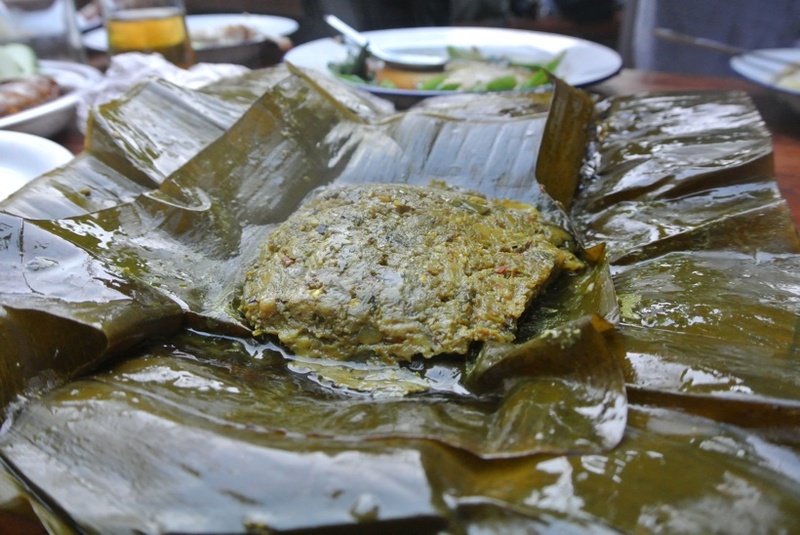 Underneath the paste-like layer of chile and herbs was a flaky piece of catfish that had been infused with the scent of banana leaf and strong Thai herbs. 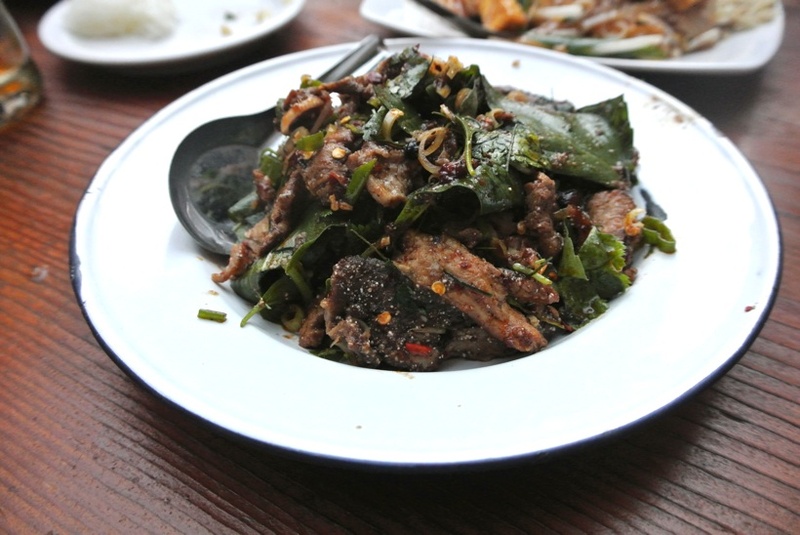 To complete the meal’s pork trifecta, here we had grilled pork tossed with an aromatic blend of basil and lemongrass. The pork itself didn’t stand out the same way it did in earlier dishes, but the fragrant herbs and heat from the bird eye chile picked up the slack. 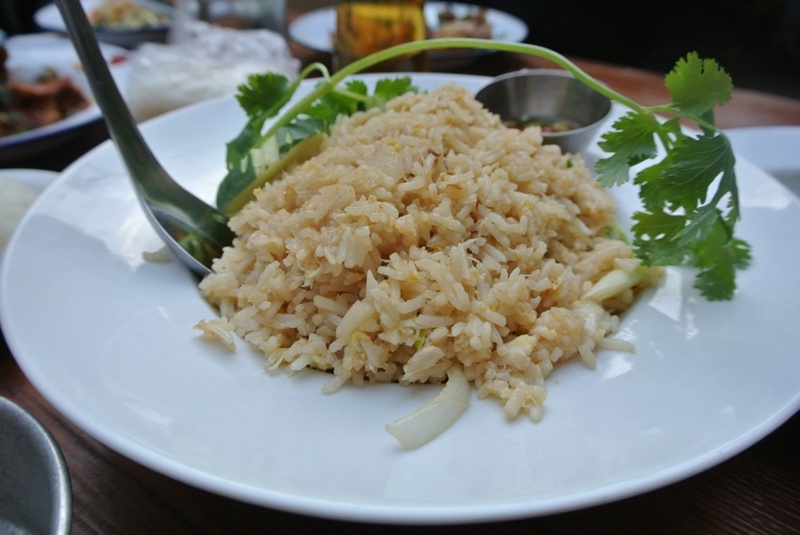 Compared to most of the other dishes, the crab fried rice was cleaner in taste, void of the intense herbs and spices that in turn allowed the sweetness of the crab meat to shine. Flawless in its simplicity and execution. 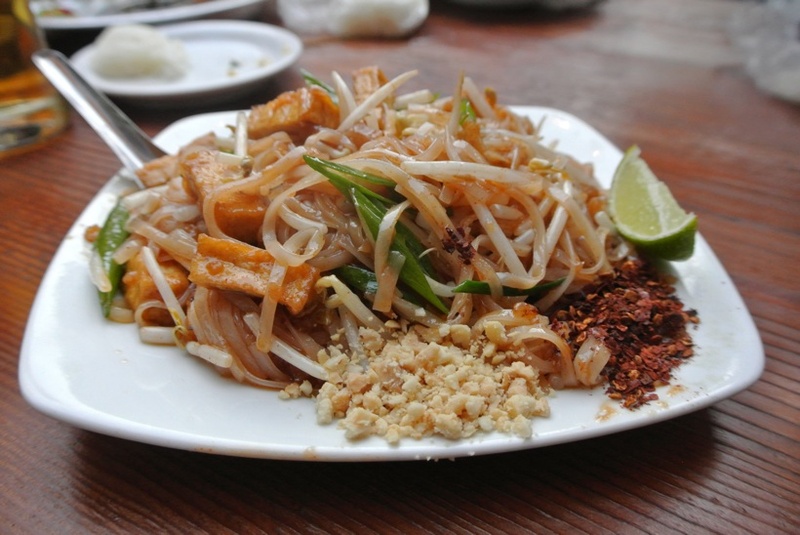 The night’s final dish just so happened to be the one most synonymous with Thai cuisine, Pad Thai. The success of Pad Thai depends on the critical balance of hot, sour, salty, and sweet, and quite frankly Night+Market nailed it. 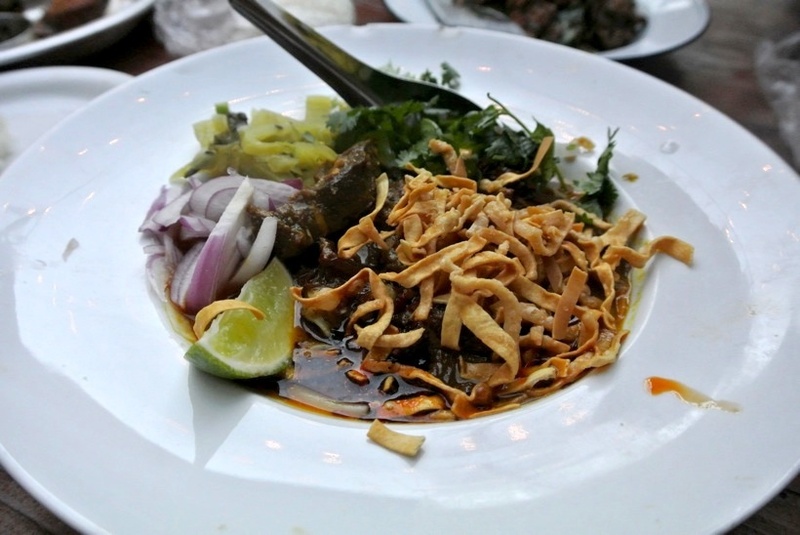 Add to that perfectly chewy rice noodles and what you have is a Pad Thai as good as any you will find in Los Angeles. Night+Market was certainly worth the wait and lived up my expectations that had only increased in the time leading up to my first visit. Nearly every dish was spot-on at capturing the essence of Thai dishes that I’ve eaten countless times, yet they more importantly managed to deliver those flavors in fresh, new interpretations that put Night+Market up there with any other Thai restaurant in the city.